Shoot-O-Rama Progressive Jackpot Slot Review - Casino Answers! Shoot-O-Rama is a 5-reel, 5-line video slot developed by Cryptologic, featuring a bonus game and a progressive jackpot. You can play the Shoot-O-Rama video slot at [Americans: Unfortunately due to legal restrictions you are unable to play at any of the online casinos this game is at. We recommend you trying playing the unique slots at Win A Day Casino instead.]. Shoot-O-Rama is a quarter slot. Bets on the Shoot-O-Rama slot machine are fixed at $0.25 per spin. You can select 1-5 paylines per spin at 1-5 coins per line. You can bet up to the maximum total bet of $6.25 per spin. Shoot-O-Rama has a low betting range that is great for casual players trying to win a progressive jackpot. To play the Shoot-O-Rama slot game, select your bet and press the “Spin” or “Bet Max” buttons. Shoot-O-Rama features a progressive jackpot, which is currently at $1,388. To win the progressive jackpot, you must hit 5 Dart symbols on a payline. It is recommended that you play the maximum bet, as you will win 20% of the progressive jackpot for each coin you bet per line. 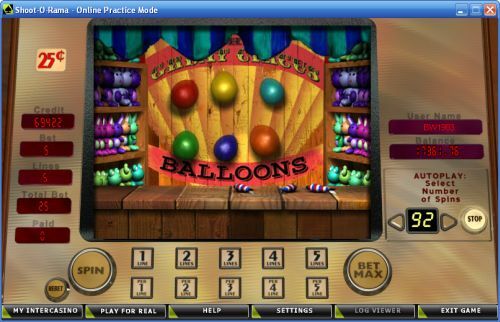 The top fixed jackpot on the Shoot-O-Rama progressive jackpot slot is the 2500 coins for landing 5 Balloon symbols. To play for the Shoot-O-Rama Progressive Jackpot, visit [Americans: Unfortunately due to legal restrictions you are unable to play at any of the online casinos this game is at. We recommend you trying playing the unique slots at Win A Day Casino instead.]. Shoot-O-Rama has a basic autoplay mode you can use to try and win its progressive jackpot. Use the arrows to select 1-99 autoplay spins. Select your bet and hit the “Spin” or “Bet Max” buttons to start the autoplay mode. To stop the Shoot-O-Rama autoplay mode at any time, press the “Stop” button. 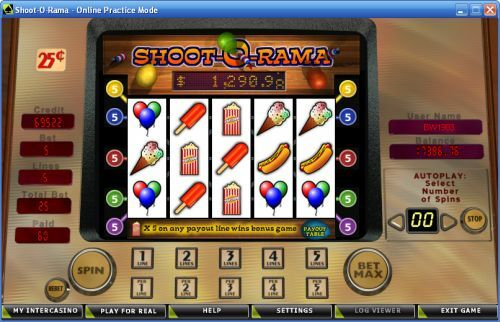 Shoot-O-Rama is a simple video slot with a progressive jackpot. To play the Shoot-O-Rama progressive jackpot, sign up and make a deposit today at [Americans: Unfortunately due to legal restrictions you are unable to play at any of the online casinos this game is at. We recommend you trying playing the unique slots at Win A Day Casino instead.]. Can players from the USA play the Shoot-O-Rama casino game for real money? No, players from the United States of America cannot play the Shoot-O-Rama online slot game for real money. For a USA-friendly slot game you can play, check out the Lucky Go Round video slot at Win A Day Casino. Can I play a free flash game of the Shoot-O-Rama slot machine? The Shoot-O-Rama progressive jackpot slot is available for play at the [Americans: Unfortunately due to legal restrictions you are unable to play at any of the online casinos this game is at. We recommend you trying playing the unique slots at Win A Day Casino instead.] flash casino for real money only. If you experience any difficulties with the instant play casino, download the newest version of Adobe Flash Player. How can I win the Shoot-O-Rama progressive jackpot? To win this progressive jackpot, you must land 5 Dart symbols on any active payline. To win the full jackpot, you must make the 5-coin maximum bet. For each coin you bet, you will win 20% of the jackpot. Where can I find more progressive jackpot slot reviews? If your dream is to hit a progressive jackpot and win it big, we recommend reading our list of progressive jackpot slots for more progressive jackpot slot reviews.